LONG BEACH, Calif. — Since 2007, transloading has grown at double the rate of U.S. imports, and supply chain experts believe it will become more popular because of the benefits to the entire supply chain. The compound annual growth rate of imports over the past nine years was 1.9%, while transloading was up 4%. Inland point intermodal dropped 0.2% during the same period, according to data from the Intermodal Association of North America, The Port Import/Export Reporting Service and rail fleet provider TTX Co. Transloading statistics aren’t tracked formally, so the percentages are estimates. Transloading involves unloading freight from a container trailer and loading it into a trailer bound for the consignee. “Transloading is a more effective use of the supply chain for the companies that make up the lion’s share of imports these days,” said Robert Leachman, professor of industrial engineering and operations research at the University of California-Berkeley. He participated in a panel discussion during the annual IANA exposition. Quik Pick Express President George Boyle said that when his customers condense five industry-standard 20-foot equivalent containers, or TEUs, into two domestic 53-footers, it saves them landed costs. For the trucking and railroad companies, transloading creates economies of scale. “So far this year, I’m not seeing a changing in the divergence. If you look at the overall volume, IPI [inland point intermodal for international containers] is not recovering to the same point as imports, but our transloading volume is up and increasing every month,” he said. 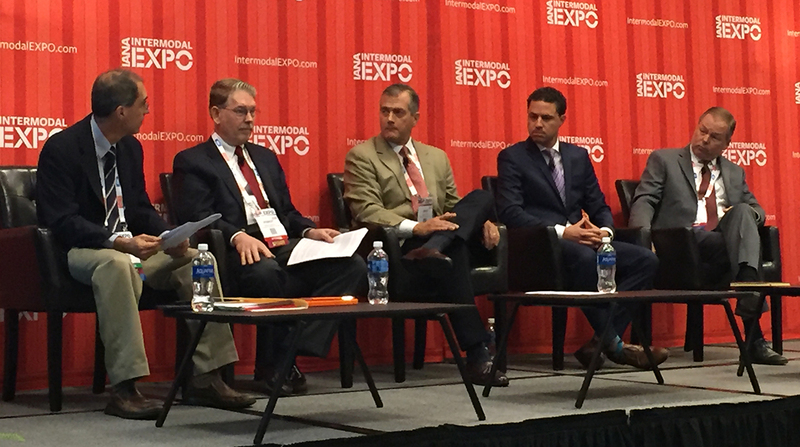 Another advantage of transloading is the flexibility, according to the IANA panelists. An inland point intermodal move involves booking a door rate with the steamship line, in which it handles the entire supply chain from origin to final destination. The seal on the international container remains intact throughout the journey. “Part of the transloading phenomena where we see more growth is due to the distribution flexibility that shippers have to point cargo to different destinations as demand changes,” said Greg Tuthill, chief operating officer of CMA CGM (Americas). Since transloading involves different companies at different points, the shipper can alter the final destination while the container still is on the ocean. “Importers using IPI must commit to how their cargo is going to be distributed across North America before they book the vessel passage. So they’re booking it one to two months in advance based on a long-term forecast. Whereas in transloading, when it arrives at a port, they can reallocate it based on a short-term forecast. It has as much to do with inventory economics as transportation economics,” said Leachman, adding that he doesn’t expect transloading growth to slow down in the near future. Megaships visiting the United States also tax the supply chain and create incentives for transloading, according to supply chain experts. For example, the CMA CGM Benjamin Franklin is an 18,000-TEU containership that called on the West Coast in 2016. While the Benjamin Franklin reduced pollution, versus two 9,000 TEU vessels, it also dumped thousands of containers at once. Transloading alleviates some of the ensuing congestion, according to the experts. The era of megships won’t dissipate anytime soon. Recently, CMA CGM announced that it would order nine 22,000-TEU containerships.